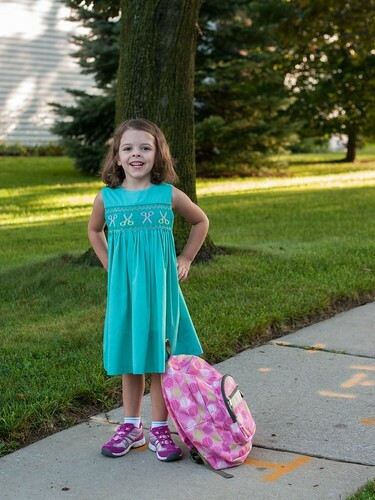 Molly started Kindergarten today! 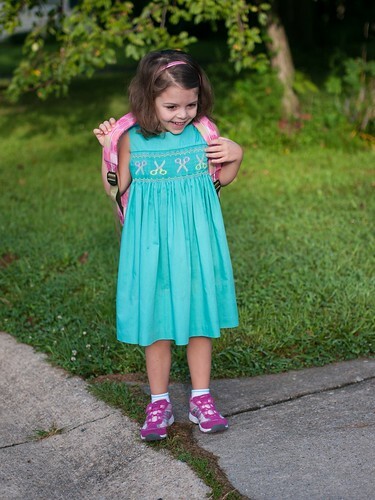 She's wearing the same dress that her Aunt Caroline wore on her first day of Kindergarten. Grams made it, and the smocking plate is even called Kindergarten Scissors. Walking to the bus stop. Thankfully, it's at the end of our street, so it's not a long walk. Molly is not scared of this one bit. She's so ready to go! 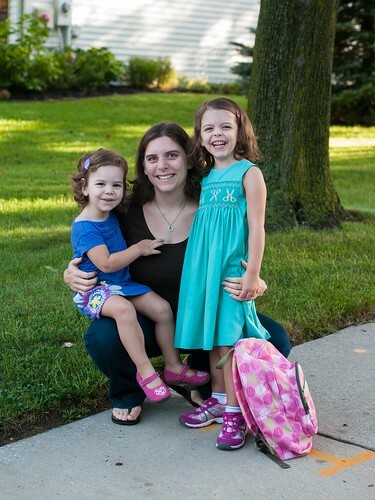 A quick photo op with Mom and Leah while waiting for the bus. 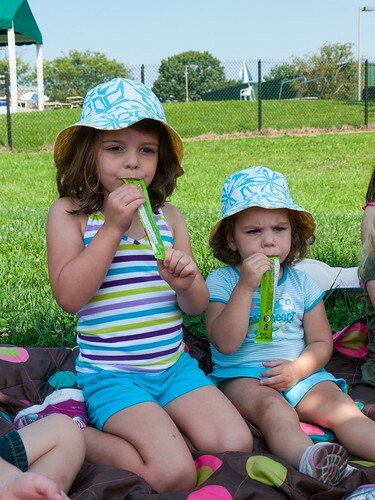 Molly said that she was very excited, and that her friend Kaylin was so excited too that she was jumping up and down. Then, she demonstrated for us. The bus is here! She was very eager to check out her bus and find a seat. 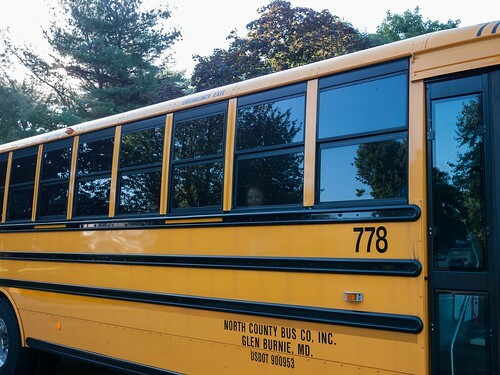 Off she goes, in her seat grinning from ear to ear as the bus pulls away. I held it together until waving to her on the bus, then walked home in tears. 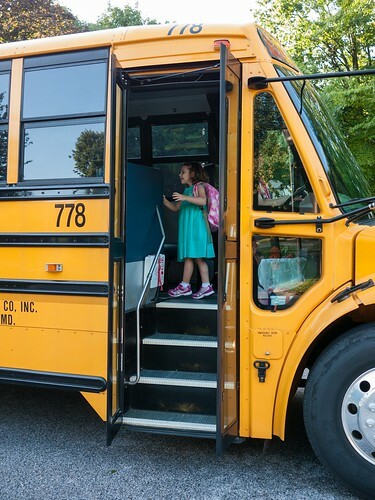 At the end of her first day, Molly got off the bus, ran to me exclaiming, "Mom! I had so much fun!" We're off to a great school year! 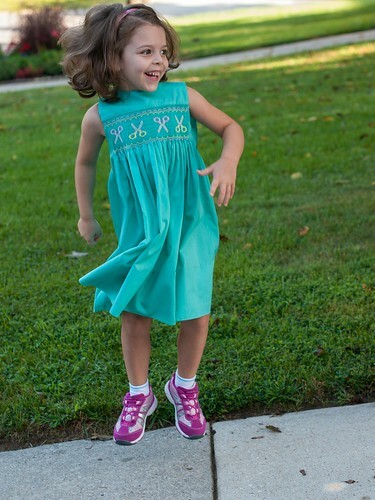 When Chad and I came home from Back to School Night on Thursday with news that Molly's friend Kaylin will be in her class, Molly squealed and danced. She is so excited to have a friend in class with her. On Friday, Molly was finally able to meet her teacher, Ms. Colella, at Kindergarten Open House. Molly toured her new classroom, finding her name at several stations around the room. 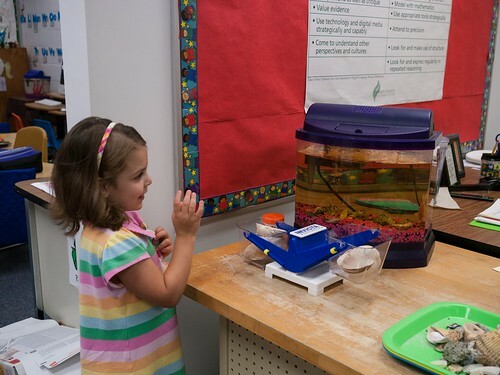 She also had to say hello to the class fish. She still has her own way of speaking to them. We are all excited for school to start, especially Molly. She was hyped on adrenaline all day on Friday. Tomorrow is the big day! We'll be back with more pictures then. 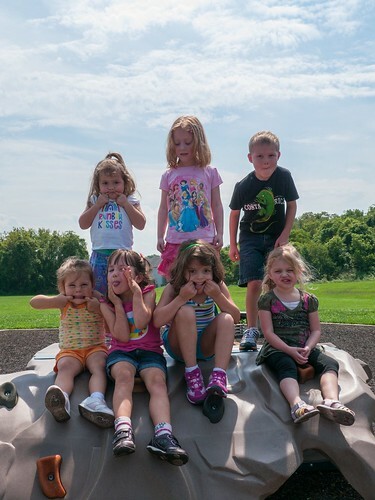 For our last summer playgroup, we met up with friends at the (new to us) Jeffers Hill community playground. How have we not know about this playground before?! 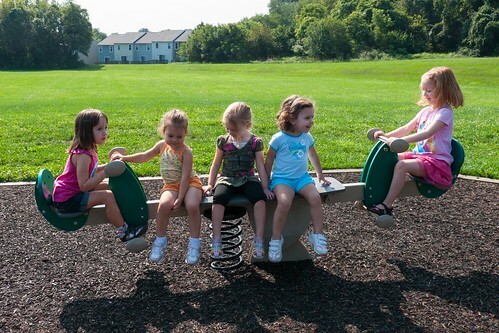 The kids had a blast on this teeter-totter. Things could get pretty rockin' when Simon was bouncing the teeter-totter. 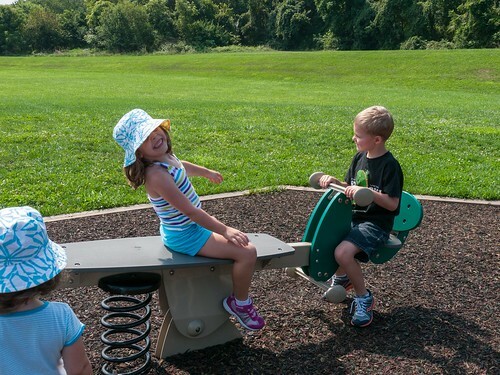 The playground has a lot of great things to play on, but not much shade. So, the picnic lunch was in the shade of a very small tree. This was the last playgroup before the big kids start Kindergarten on Monday. Molly will miss seeing all these silly friends every week. 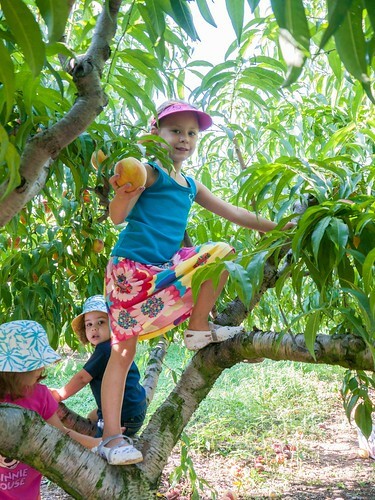 In honor of National Peach Month, I also took the girls to pick peaches at Larriland Farm this week. 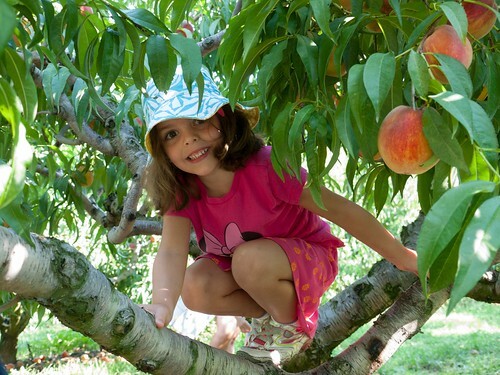 Molly loved climbing the peach tree in search of the perfect peach. Leah had to get in on the tree climbing too. I eventually had to stop the great peach pickers since the box was full. We came home with 20 lbs. of peaches. Mmmm, that's a lot of peach goodness. I've already got peach custard ice cream, peach salsa, and peach & brie quesadillas on the menu this week! 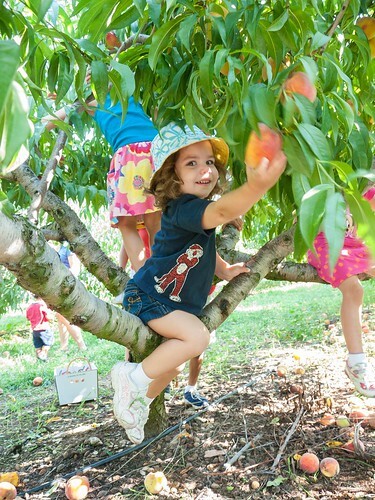 Picking peaches with friends makes it even more fun. 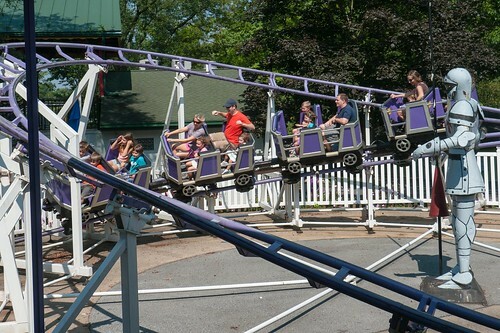 On Thursday, we headed with some friends to Dutch Wonderland for one last summer hurrah. 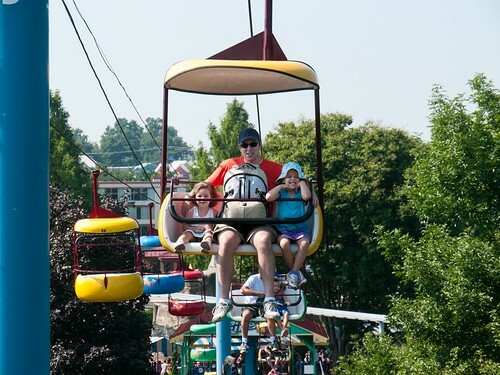 Our first stop was to hop on the Sky Ride to be carried to the back of the park. Here's Leah, Molly, and Chad high above the trees, which the girls loved. 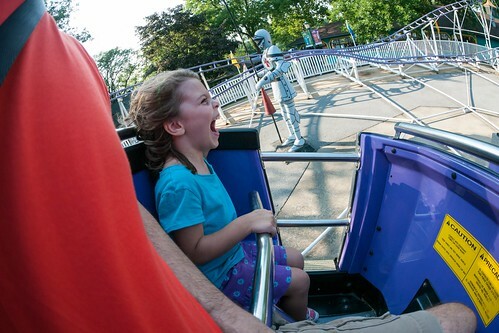 When we arrived, Molly said she would not ride any roller coasters. 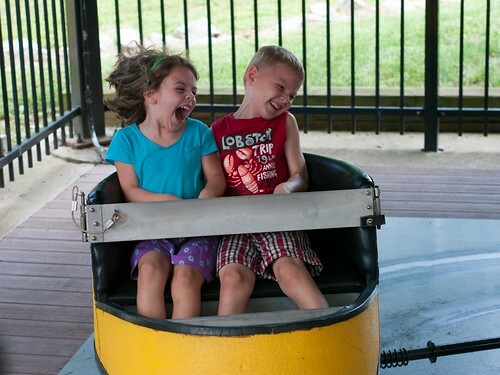 However, once she saw the Joust and heard Simon say he was going to ride it, she chose to participate. 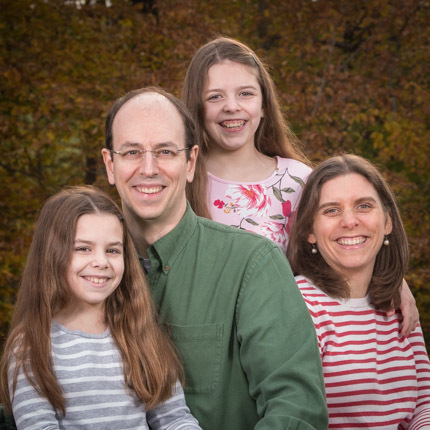 Much to my surprise, so did Leah, who was barely tall enough to be allowed on with a parent. 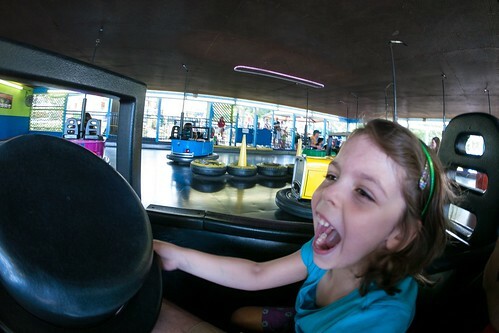 Next stop - bumper cars. Molly loved this too, but Leah did not and cried the whole time riding around with me. This left her not wanting to participate for a bit, but thankfully she joined back in after lunch. We took a ride on the monorail, of course. Molly still likes peering out the window, just like she did 3 years ago. 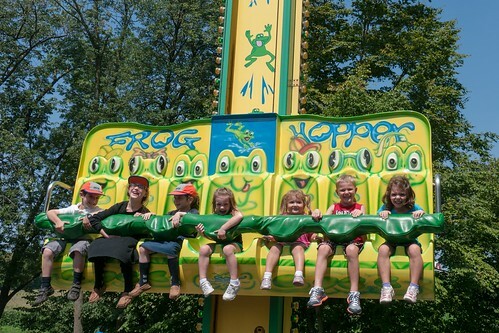 The Frog Hopper, which lifts you up then drops you a bit, was loads of fun for all. This year they've opened a full-service restaurant called Merlin's. It was great. Not much more expensive than the cafeteria and vendor options around the park, but so much nicer menu and service. Highly recommended. And the portions were huge. 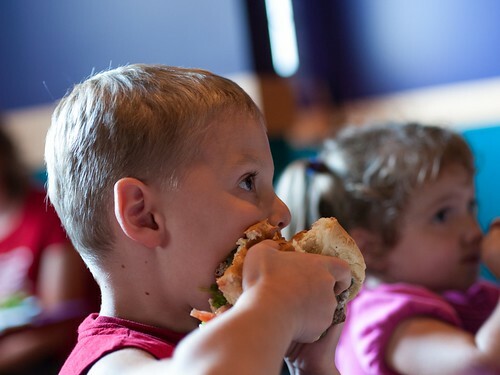 Here's Simon chowing down on his children's hamburger. I think Molly enjoyed every ride she went on except this one. This picture was taken before the shuttle got fully going. Once it did, she got very queasy. Possibly not the best choice of ride immediately after a big lunch of fried chicken fingers and fried tater tots. One nice things about our visit was the lack of lines. 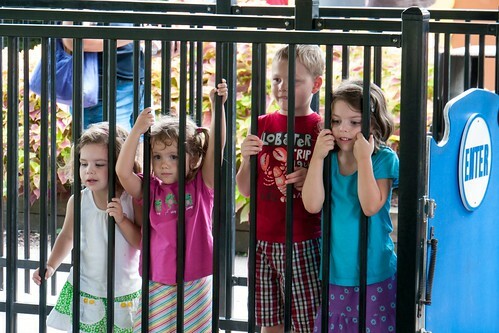 Only a couple of rides had really long lines. Many of them looked more like this. 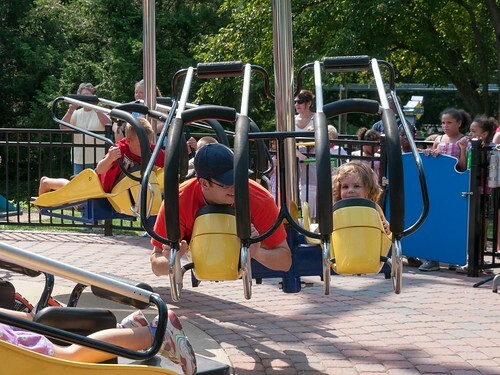 The Wonder Whip is a simple little ride that pulls the kids along then whips them quickly around the end, but the kids loved it. 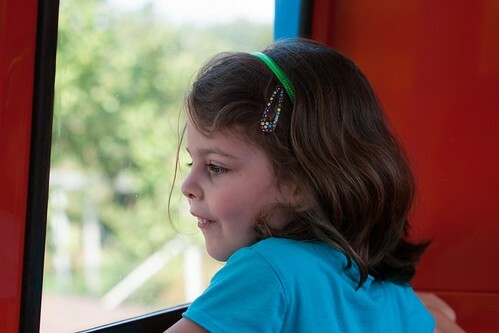 There were a few rides that Leah could not ride, and a few that she chose not to ride. 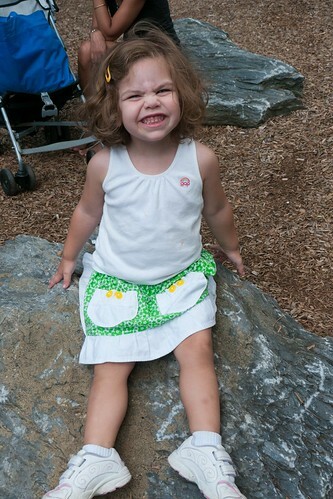 While resting as others rode the Turtle Whirl, but she proclaimed herself the "Princess of the rock." This ride was definitely not for me. 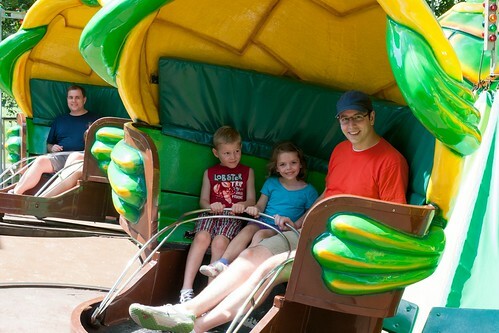 If you don't like spinning around, avoid the Turtle Whirl. For the rest of them, it was a lot of fun. 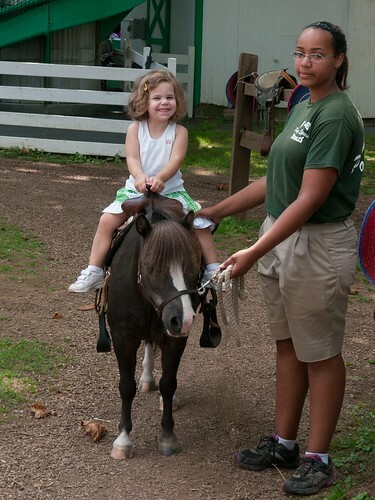 Leah finally snapped out her funk when she got to do the thing she'd been asking for all day - ride the pony. They even gave her a fun miniature one. The girl's love the Crazy Plane, which goes in a circle and gets pretty high, as well. Molly exclaimed shortly after the ride got underway "This is so much fun! Mommy would not like this." She knows her Mom well. 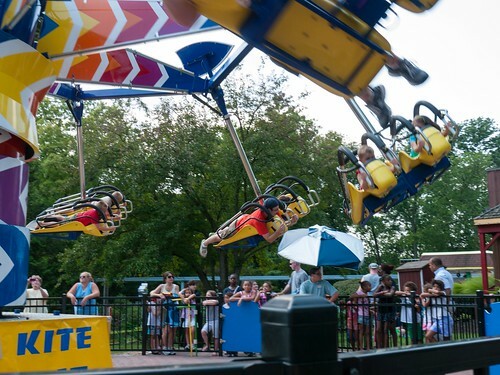 This ride, called Kite Flight, has you lie on your belly and fly through the air as if you were in a hang glider. 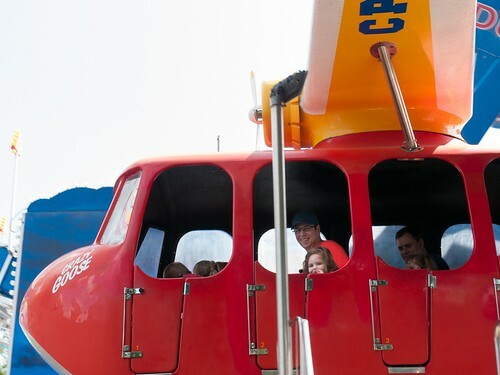 We decided it was more like flying like a superhero, so instead referred to it as the Superman ride. And yes, that's Leah going on this one. It shocked me that she wanted to, but she did and she loved it. One of her favorites of the day. 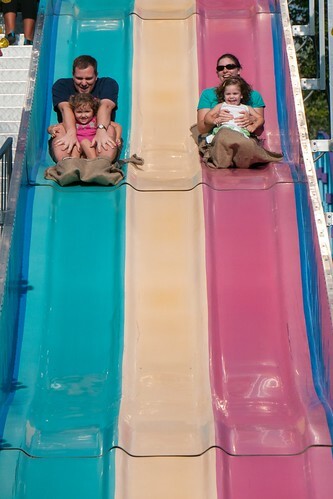 The Fun Slide was requested multiple times during the day. 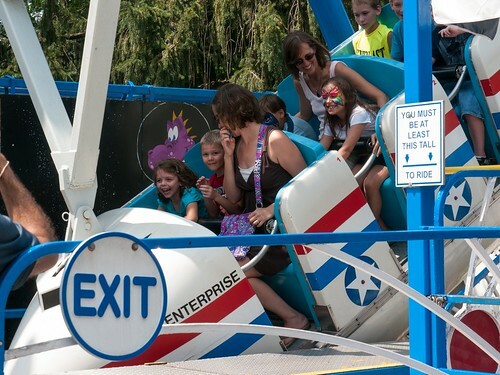 It was the perfect ride for the younger kids, while the older kids did a bigger ride. It may have gotten a bit competitive here, as Zach and Matilda have pulled ahead of Leah and me. Before heading out, we did the Joust roller coaster one more time. This time, I rode with Leah and Chad rode with Molly. Here's a shot of her as we zoomed around. I think she's enjoying it! Chad and I were so proud of how well the girls did. They rode some rides that I wouldn't even tackle. On our drive up, Molly asked if Leah got to skip her nap. When the response was yes, Molly turned to Leah and proclaimed, "Ooo, it's your lucky day!" It turned out to be a lucky day for us all. We had a blast. You can see more pictures from our day on Flickr. Molly had many activities this summer, including her first time taking tennis lessons. We’ve played a few times just in the family before, but this was her first time taking proper lessons. There were one or two rough weeks, but she ended up having a great time and doing great. Here’s a small taste of her mad tennis skills.